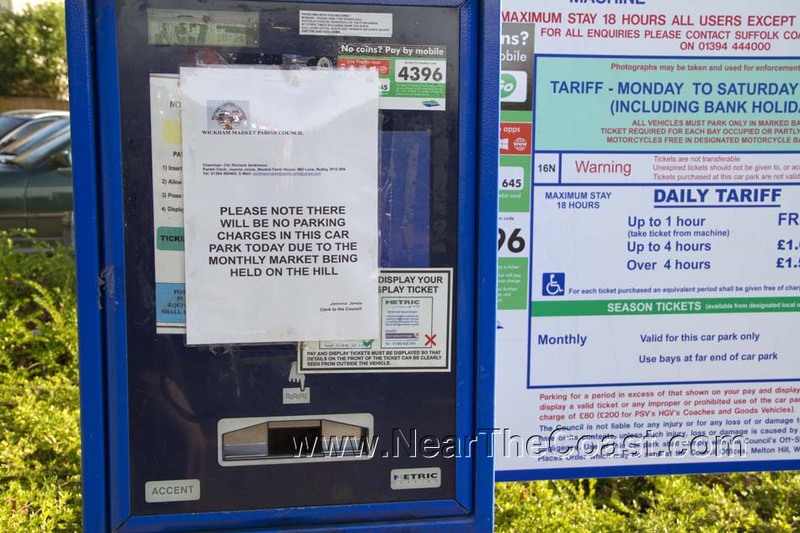 Don't know when video hire and bicycle shop Hasnip's at the bottom of the hill in Wickham Market closed, there's no mention of it in this October tribute to Bob Hasnip. House sales active in Saxmundham, Wickham Market, Woodbridge and surprisingly Laxfield. Tomorrow is the second Wickham Market Cycle Sportive with proceeds to the Wickham first responders. Sax Velo will be in attendance for sales and service. Monday for all the family the Wickham Market Treasure Hunt. The Martlesham Tesco really very busy today and a queue for the Wickham Market Coop car park ... is there something we don't know? ♫ In aid of the Beehive Children's Refuge Kenya there's a flute and piano concert in All Saints Church Wickham Market 3pm tomorrow. 12 noon Saturday there's a share launch in Wickham Market to buy and restore The George which has been closed since a major fire in April 2013. 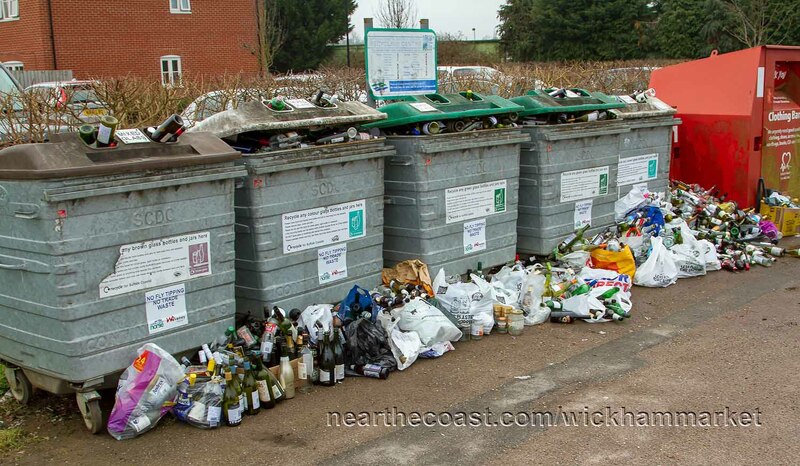 Don't know what's happened in Wickham Market at the bottle bank by the Co-op ... maybe it was somebody's birthday? We were told in the dentists that the Wickham Market post office had a makeover maybe two? three? years ago so that's how long it is since we've been in there. The PO is looking cheerfully bright, is selling household goods, food and has a significant stationery area ... and here's a good idea at the Wickham allotments. What must have been a scary experience for the householder when two men broke into a Wickham Market house in the early evening last Wednesday. Laying new track will close the Ipswich-Halesworth rail service for nine days from this Saturday the 29th and the Ipswich-Felixstowe for the next two weekends. Ipswich-Halesworth stations affected include Woodbridge, Wickham Market and Saxmundham, there will be replacement bus services for both lines. The 69th Wickham Market village show is the first weekend of next month. There are over a 100 classes with displays of vegetables, flowers, photography, cookery and handicrafts plus this year's theme is Hedgehog Protection. Judging by people arriving carrying cushions and a full car park at Wickham Market village hall Saturday night it was film night, next month's presentation Eye in the Sky with Helen Mirren and the late Alan Rickman. JOBS Registered General Nurses wanted in Wickham Market and Framlingham with benefits including a free uniform and a potential £500 welcome bonus. Wickham Market in 2011 to 2007. A bit busy in Wickham Market this morning. A continuous (and sinuous) queue in the butchers (we gave up twice), the dentist running a bit late, not much space in the public car park, temporary traffic lights by the A12 roundabout and the Co-op, and a queue to get into the Co-op car park. Since Thursday last week there's been a Subway at the back of the Wickham Market Coop. At the checkout a female staff member told us the staff were pleased it didn't make cooking smells. 2016 is the fiftieth year of the Wickham Market Flower Club and they will be having a Golden Anniversary celebration in April. Woodbridge + District (+ District a slight improvement on the patronising and surrounding villages) safer neighbourhood team proves it is + District by having an all welcome priority setting meeting tomorrow evening in Wickham Market village hall. The high winds last night left back roads near the coast with a light dusting of branches and free parking in the council car park as it's market day in Wickham Market.